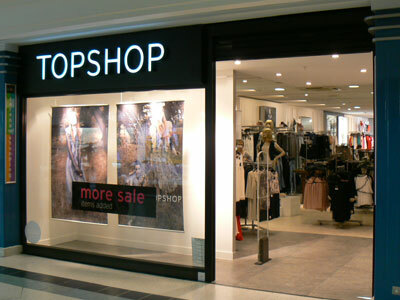 Fareham Topshop - Smallest Topshop ever! So it's nearly Spring time, my favorite season. Yay! This means that all clothing stores are starting to build up their Spring lines. Over the weekend, I took a cheeky trip into Topshop to see their new clothing items. The first thing that I spotted was a denim skater skirt, the first skirt I've ever seen that I fell in love with. (I'm not a skirt girl at all!) But I just couldn't help but try this beauty on. I searched high and low for tops that would go with the skirt and tried them all on. As soon as I tried the skirt on, I fell even more in love with it. It was figure hugging and even as a high waisted skirt, I kept my dignity and didn't flash my pants. (Always a plus haha!) The skirt will literally go with anything. Whether you prefer the rock chic look, or a girly look, it looks good with any style! In the end I opted for a white summery top, with a cute cutting in the back of the top. (My favprite part of the top!) and my friend opted for the grey 'Eyelash crop top'. We both agreed on black tights with the skirt, especially as black tights give the illusion of long legs! My Brown boots are from Ebay! How would you style this skirt? What are your favorite Spring styles?